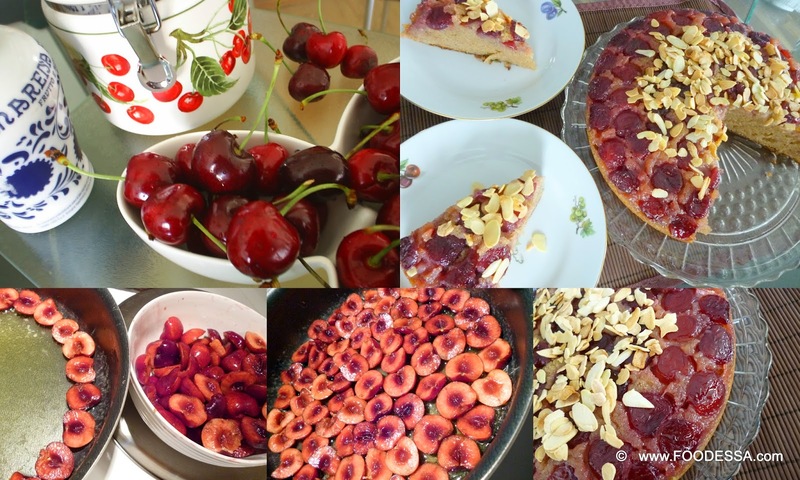 Ruby red cherries find themselves in the company of Gluten free flours. Splashes of Amaretto and vanilla bring out the best that cherries can offer in a cake. This is how we are depicted in our family. Without hesitation, we can have them for every meal of the day. Come place a great bowl of cherries at the table and just see what happens. A slightly uncontrollable flock of usually well behaved persons grabbing at cherries. I think pigeons pecking at bread crumbs are better behaved. Alright, maybe I'm exaggerating just a little...or am I?
. Helps improve eyesight with its beta-carotenes.
. Eases joint pain with its anti-inflammatory qualities.
. Keeps cholesterol at bay with its soluble fiber rich pectin.
. Improves sleep with its naturally occurring melatonin hormone.
. Protects the colon with its quercetin, an anti-carcinogenic flavanoid. Lastly...one great perk...1 cup (250ml) of pitted cherries has only 97 calories! Now, baking with them is a little tougher for me to handle. Why?..How could I let go of those delicious ruby reds from their luscious fresh bites? Up until now, the only time I've cooked cherries was for a jam with Amaretto. That's only because the cherries were not to my expectation. A little sugar and voila...the cherries perked up. Well, I decided to apply the same pick me up in this scrumptious upside down cake. Replace the same amount in All-Purpose flour and eliminate the apple cider vinegar.
. Pre-heat the oven to 350F/180C/Gas4.
. Grease only the sides of a 9-inch (23cm) round cake pan. 1. In the cake pan, place the butter, brown sugar and lemon juice together. Once the oven is heated, place the pan in for 5 minutes until it bubbles. Remove pan and start placing the cherries (cut side up) in a concentric circle. 2. Sift together the flours, baking powder and salt into a bowl or piece of parchment paper. Set aside. 3. In a large bowl, beat the oil and sugar until smooth. 4. Add the eggs, one at a time, beating well after each addition. Beat in the vanilla and Amaretto. 5. Now, add half of the dry ingredients on low speed until blended. Add and blend in the milk and apple cider vinegar. Add the remaining dry ingredients and mix until combined. 6. Gently pour the batter onto the cherry base. Bake for about 45 minutes. 7. Remove the cake pan from the oven and onto a rack for about 5 minutes. Lightly pass a thin spatula around the cake. Afterwards, invert it on a serving platter and leave it alone for another 5 minutes before uncovering it. 8. In the meantime, place the almonds into the oven or a stovetop to lightly roast for only 3 minutes. Watch them carefully. 9. Evenly distribute the toasted almonds over the center of the cake. Serve it at room temperature. The cake will keep lightly covered at room temperature for about three days without drying out. Enjoy. Since cherries barely increase my blood sugar levels ... I'll take full advantage of keeping them close by. If by chance they aren't to my liking ... I'll give them up into another baked delight ... Cherry clafouti perhaps? Enjoy the sweet freshness gifted by mother nature.